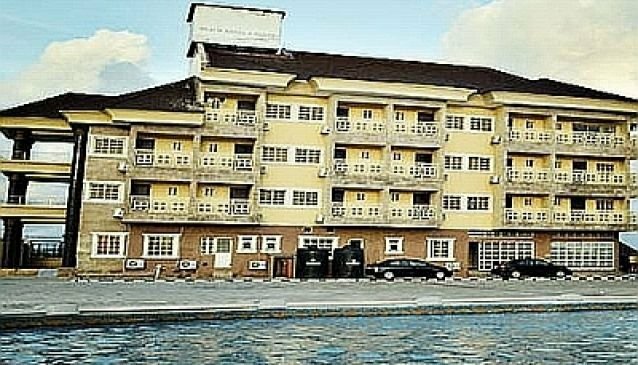 Vantage Beach Hotel is located opposite the Lekki Phase 1 along the sea shore. It can be found at the Okunde Blue Water Scheme, Maruwa bus-stop. Vantage Beach Hotel is one of the beach hotels in Lagos. This hotel is built right at the sea line so you can see the ocean right from your balcony. There is a seaside activity center on the ground floor where you can partake in jet ski rides, quad bikes, boats and music. The restaurant at the hotel provides meals in both local and foreign menus. The bush bar downstairs takes care of your drinks, cocktails and water; as well as keep you grooving to the music from its speakers. There is a swimming pool & gym present at the hotel. Room service is 24 hours and parking at the hotel is secure.